The Touch Bar is an interesting proposition. Part innovation, part work around. The technology is Apple’s attempt to embrace a new form of input while continuing to eschew touchscreen on its computers. I was mostly pleasantly surprised by the technology, in terms of its capability, versatility and responsiveness, but for now, it’s not exactly a game changer. I’m not sure the rest of us we’re eagerly awaiting someone to do away with the row of function keys, but maybe that’s why Schiller gets paid the big bucks. In some cases, the Bar feels like a tradeoff. Certain functionality now takes a couple of extra clicks to access, and the whole set up just isn’t as customizable as it could be. And it will be a while before third-party support is anywhere near ubiquitous. Even so, there are still a lot of cool tricks to be performed with Apple’s proprietary software, as the company looks to demonstrate the versatility of the new technology across its own offerings. Customizing the Finder: This is at once one of the simplest and most compelling bits of functionality. Click into View in the Finder, and the screen will go translucent. From here, you can customize your favorites by dragging and dropping different buttons onto the bar. 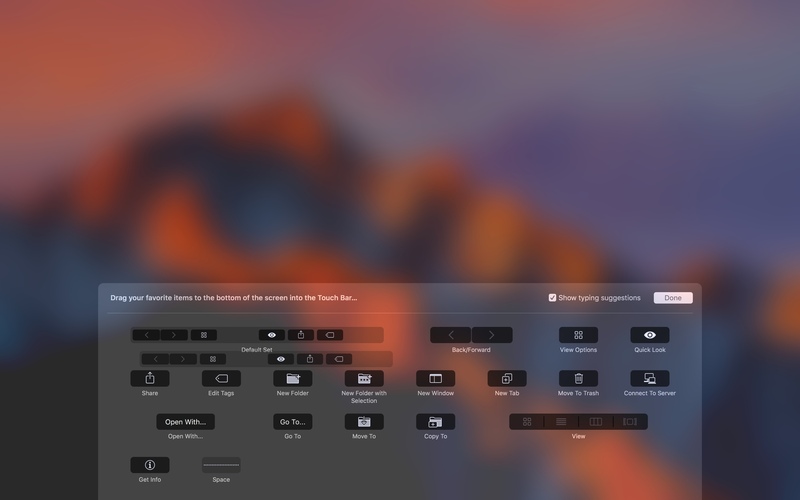 It’s the one place where the user can currently interact directly between the screen and Touch Bar in this manner – and it opens the door to a lot of potentially innovative usage. It also, hopefully, hints at a more customizable future for the Touch Bar in its various apps. Media Scrubbing: This is one of the spots where Apple has focused the new technology on media professionals. The Touch Bar is a really intuitive way to scrub through media, be it when editing in apps like Final Cut or Garage Band (iMovie functionality is sadly lacking) or playback in iTunes or while watching video. Photo Galleries: The principle is similar here, but in this instance, the functionality takes better advantage of the Retina Display resolution, offering thumbnails of your photos, so you can scroll through a lot quickly. Of course, the 2170 × 60 resolution coupled with limited real estate means they’re pretty small. Calendar: The Touch Bar offers a quick way to swipe through the endless scrolling of the months and years. All we are is dust in the wind. Phone Calls: For whatever reason, I don’t take a lot of calls on my computer. Yet I Skype all the time. It doesn’t even occur to me to try out the functionality until I got an incoming call while working on the review. The strip lights up and you can take it directly from the Touch Bar. Once on, you can hang up, mute or switch to video. All the while, it displays the name of the person on the line, coupled with how long you’ve been on. The feature will no doubt work well with Skype, too. Text Formatting: A little dull, but I like it. Highlight text and you can change the alignment, style, font and customize the color with a few taps. It’s a feature that’s much handier day to day than predictive text – which makes a lot more sense on the limited real estate thumb typing of a smartphone screen than a full-on QWERTY laptop. Emojis: Like it or not, the Touch Bar is offering big back door for emojis to make it onto the computer in a major way. And the Retina Display is pretty much exactly the perfect size for showcasing smiling poop and happy faces. Honorable mentions go out to Maps, which features icons for different businesses, so you can choose a place Yelp-style and Safari, where tabs appear, so you can quickly scroll through everything you’ve got open.